Should you be taking it? If so, when, how much, and what kind? Daily aspirin can prevent heart attack and stroke, but it's often misused. If you don't have heart disease but do have high blood pressure or other risk factors, don't automatically assume daily aspirin is a good idea. "A lot of people take aspirin who really shouldn't," says Dr. Christopher Cannon, a cardiologist at Brigham and Women's Hospital and professor of medicine at Harvard Medical School. "Everyone assumes aspirin is harmless, but it's not." For some, the downsides of aspirin—mainly gastrointestinal bleeding—outweigh its benefits. Here's what you need to know about aspirin, including details about dosage, formulations, and ways to boost aspirin's benefits and lessen its risks. If you've had a heart attack or an ischemic stroke (the type caused by a blood clot), taking a low-dose (81-mg) aspirin every day is probably a wise move. The same is true if you face a high risk of having a heart attack—for example, if you have chest pain (angina) from heart disease, or have had bypass surgery or angioplasty to treat a narrowed heart artery. 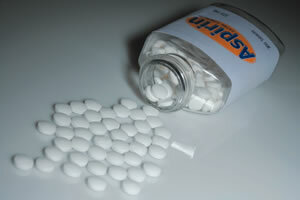 Aspirin prevents platelets from clumping together in your blood and forming a clot. Most heart attacks happen when a clot blocks blood flow in a vessel that feeds the heart, so dampening the clot-forming process lowers your odds of a blockage. To estimate your risk of having a heart attack or stroke over the next 10 years, you can use one of the calculators listed at www.health.harvard.edu/147. If your value is 10% or higher, daily low-dose aspirin may be helpful. But the decision should always be based on a discussion with your doctor. He or she should consider other health conditions you have, medications you take, and even your weight. In addition to lowering the blood's ability to clot, aspirin also inhibits helpful substances that protect the stomach's delicate lining, creating a "double whammy" effect. As a result, stomach upset or bleeding in the stomach and intestines can occur. If you take daily low-dose aspirin and your stomach starts bothering you, call your doctor, says Dr. Cannon. With minor bleeding, a blood test may reveal a low red blood cell count (anemia). With more serious bleeding, your stools turn black and smelly, and in rare cases, you may vomit blood, which requires hospitalization and a possible blood transfusion. Taking aspirin with food may help; so do drugs to treat heartburn, which help protect your stomach. These include simple antacids like Tums, acid blockers like famotidine (Pepcid, Fluxid, generic), or proton-pump inhibitors (PPIs) such as omeprazole (Prilosec, Zegerid, generic). A pill that combines aspirin and omeprazole may soon be available. Daily aspirin users can also lower their risk of gastrointestinal bleeding by avoiding nonsteroidal anti-inflammatory drugs such as ibuprofen and naproxen. And those who drink alcohol should do so in moderation: no more than one drink a day for women of all ages and men older than age 65, and up to two drinks a day for men 65 and younger. 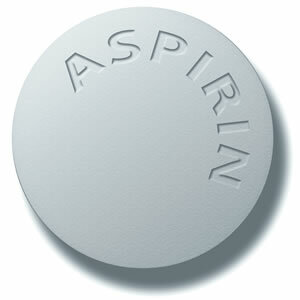 Whether or not you take daily low-dose aspirin, keep a stash of regular, full-strength (325-mg) aspirin handy. Why? If you think you're having a heart attack, doctors recommend chewing an aspirin, right after you call 911. If you don't have 325-mg pills, take four low-dose pills. Failing that, most emergency medical services will give you one en route to the hospital or once you're there. Most of the low-dose aspirin sold in the United States is enteric-coated (sometimes called safety-coated). The coating allows the aspirin to pass through the stomach to the intestine before fully dissolving. That is supposed to lessen stomach upset, but in reality aspirin still affects the entire digestive tract via the bloodstream. "Enteric-coated aspirin does not decrease the risk of gastrointestinal bleeding compared with uncoated aspirin," says digestive disease expert Dr. Loren Laine, a professor of medicine at Yale University. The same is true for so-called buffered aspirin, which combines an antacid such as calcium carbonate (found in Tums) or aluminum hydroxide (found in Maalox) with aspirin. There's also evidence that not all the aspirin in coated pills gets into your circulation, which can compromise its heart benefits. Your best bet may be chewable low-dose aspirin, which you may remember from childhood as orange-flavored "baby" aspirin.